Instead of readers searching for new comics, the Cloudscape Comics Society is bringing original comics to readers. Until October 5, Comics in Transit will adorn 10 bus shelters across Vancouver with one-page comic posters depicting city life in different cultures. “It seemed like a great venue to take what is inherently in book format out into the public sphere so that people would be able to enjoy it in their daily lives,” said Oliver McTavish-Wisden, Cloudscape president. He came up with the idea of Comics in Transit when he discovered the City of Vancouver’s Transit Shelter Advertising Program, which offers free advertising space to non-profit arts and culture organizations that can produce their own posters. “Comics in Transit should appeal to everyone, especially students, because they’re going to be the ones taking the bus and reading these things. Hopefully they’ll spread the word and maybe we’ll be able to continue this project in the future,” he said. The comics were created as a way to introduce Vancouver’s multi-cultural bus ridership to new cultures or remind them of their homeland, with comics about Paris, Ireland, Japan, Copenhagen, Thailand, Guadalajara, and more. 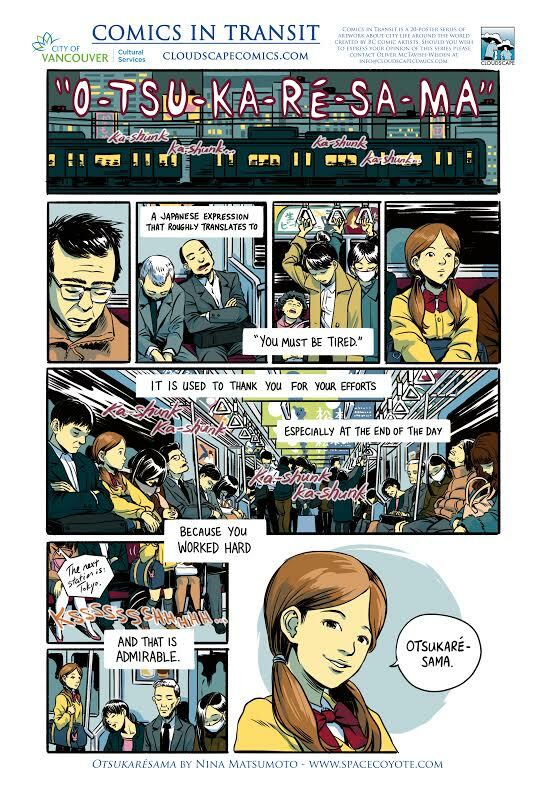 One of the comics, Otsukarésama by Nina Matsumoto, follows a girl as she rides the Tokyo subway and notices the passengers around her are asleep after a long day. The comic explains through words and illustrations the meaning of the Japanese expression otsukarésama, which acknowledges when an individual is tired from hard work, and shows appreciation for their effort. The comic concludes with the girl sharing the phrase with the passengers before she departs. Along with introducing readers to different cultures, Cloudscape is taking readers back in time with their latest graphic novel anthology, Epic Canadiana #2. Based on the original Canadian comic books made during World War II when Canada banned any non-essential imports, the Epic Canadiana anthologies explore the stories of Canadian characters and superheroes. “There were a lot of cartoonists who were very nostalgic of that time when we actually had our own comic book companies and our own comic book characters,” said Bevan Thomas, Cloudscape’s publicity manager, who led the team that created the first Epic Canadiana. “There are a few people who have re-published some of those old Canadian books, but Bevan wanted to make his own new universe,” McTavish-Wisden said. Epic Canadiana began as an eBook that didn’t draw as much attention as the printed Cloudscape anthologies. But thanks to a publishing grant that required Cloudscape to publish three books to qualify, Epic Canadiana was printed to meet the quota, and then spawned a sequel. The anthology was partly funded by the supporters of Cloudscape’s Kickstarter campaign, which raised over $3,600 from more than 85 backers when it concluded on September 14. The upcoming graphic novels, which will have Kickstarter campaigns before the end of the year, include Kathleen Gros’ Last Night at Wormwood High and Steve LeCouilliard’s Una the Blade. Comic fans and artists are encouraged to drop by Cloudscape’s weekly open meetings on Wednesday nights at 7:30 p.m. at Cloudscape HQ, located at Memorial South Park at 5955 Ross Street in Vancouver. As part of BC Culture Days, Cloudscape will be hosting a workshop on how to make mini-comics from 12 p.m. to 4 p.m. on September 26 at Cloudscape HQ. The all-ages workshop will explore what goes into creating a comic book, such as writing, character design, layout, inking, and production.